Perhaps, you are in the middle of considering updating your garage. Remodeling your garage is a way to add instant beauty to your home and increase its value too. The key to a great garage redesign is adding custom high-alloy aluminum garage organization cabinets. These are much more suitable than the generic brand in most garages because they are specifically designed to last and fit your space. Generally, there are two types of garage cabinets. They include the Select™ Series, which are modular and available in pre-configured layouts. These are typically ordered as-is and can be used as base cabinets to start your workspace layout. For example, the custom garage cabinets provide greater organization, better flexibility, and optimal use of your garage space. Of course, the average consumer would prefer that their garage cabinets have a high-end look. This is only possible with high quality materials. Don’t cut corners. By shopping at a local store for those imported brand garage cabinets that are generally constructed out of flimsy, inferior quality particle board, wood, and steel. Instead, place your order for our high-alloy aluminum garage cabinets. We’ve had over 25 years of experience providing our organization solutions. We even guarantee our cabinets for a lifetime. 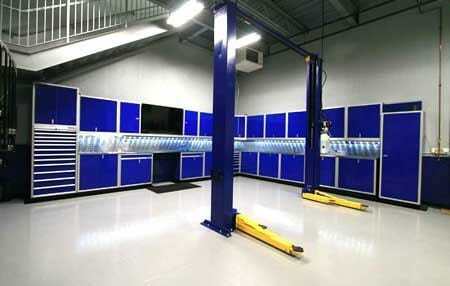 We create Moduline Cabinets to perform like workhorses in your garage, shop, or other environment. To plan your garage organization, we suggest calling us to tell us about your space and we will help you with choosing your cabinets.